Christ arose early Sunday morning, on the 1st day of the week. Some of His women followers had come to anoint His body with spices, and they wondered how they would move the stone that was in front of the tomb. An angel had come from heaven with such force that it caused an earthquake, and that angel rolled the stone away. When the women saw this angel they were frightened. This angel then gave the women instructions to go and tell the disciples that Christ has risen. When the women told the apostles “Christ has risen” they didn't believe them. Then Peter and John had a race to the tomb to check if Christ had risen. The first person to see Jesus was Mary Magdalene. Jesus then appeared to two on the road to Emmaus, but they did not know who He was. These two then went back to Jerusalem and told the others that Christ has risen indeed. And while they were speaking Christ appeared to them. Jesus Christ had to eat food to prove to the disciples that he had risen, and was not a spirit. Doubting Thomas had to put his fingers in the holes of His hands and feet, before he believed that Christ arose. May we also believe that Christ has risen. 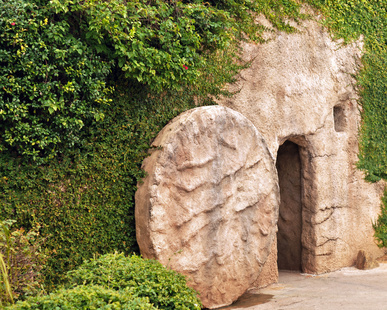 Christ has risen - click here to read why he died for us.